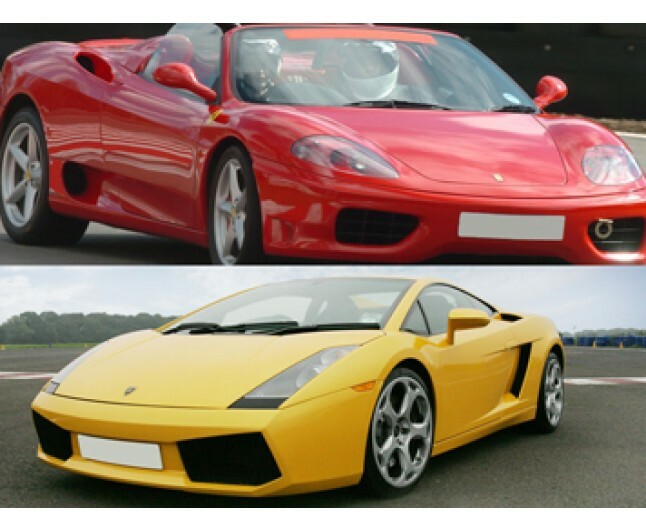 Get behind the wheels of the world's most famous supercars - Ferrari and Lamborghini Gallardo. 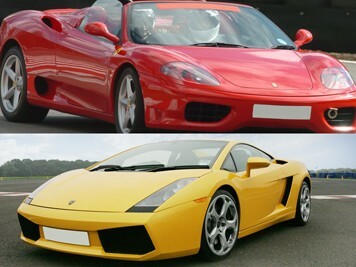 "The Lamborghini Gallardo is almost certainly the best supercar in the world right now". Autocar Magazine, and it's the Beckhams favourite car. When you put your foot down the V10 engine wails behind your head and pushes you forward at an incredible pace. This "force of nature" has to be experienced to be believed. The Ferrari is quite simply one of the most famous super cars of all time and never disappoints. The luxurious leather may lull you into a false sense of security, but this car is a thoroughbred and loves to be driven on the limit. You will be made to feel like a Premiership Footballer for the day. Welcome, introduction and briefing 6 Laps in both the Ferrari and Lamborghini 6 Laps in either a Subaru Impreza or Evo 8 A Session in a Peugeot 106 on gravel PLUS 2 hotride laps! You will be presented with a certificate and a driver analysis form completed by your instructor. A great momento for this awesome experience! This gift experience is for one person only. The experience is valid for 12 months from date of purchase. Not to be used in conjunction with any other offers or discounts. Please book well in advance. This experience will last for 4 hours, please arrive 15 minutes prior to your arranged start time. Starting times are 9am and 1pm. You must be in possession of a valid driving licence to take part in this experience. Your experience will go ahead subject to safe and suitable conditions on the day. Spectators are welcome. For safety reasons, please ensure that the user of this experience wears flat, sensible shoes on the day and dresses appropriately for the weather on that day. Maximum height for this experience is 6'5" and maximum weight is 18.5 stone. Itineraries and vehicle models may vary slightly depending on the venue.